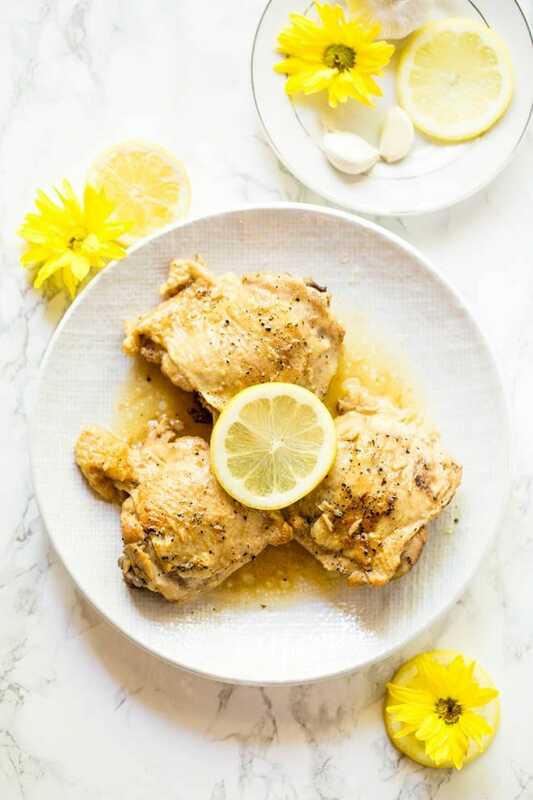 Lemon Garlic Butter Chicken Thighs are made in the Instant Pot or pressure cooker with a few simple ingredients! The chicken thighs recipe is low carb and packed with flavor. Are you looking for a flavor-packed low carb dinner? If you love quick and easy dinners, then I have the perfect dinner recipe for you. 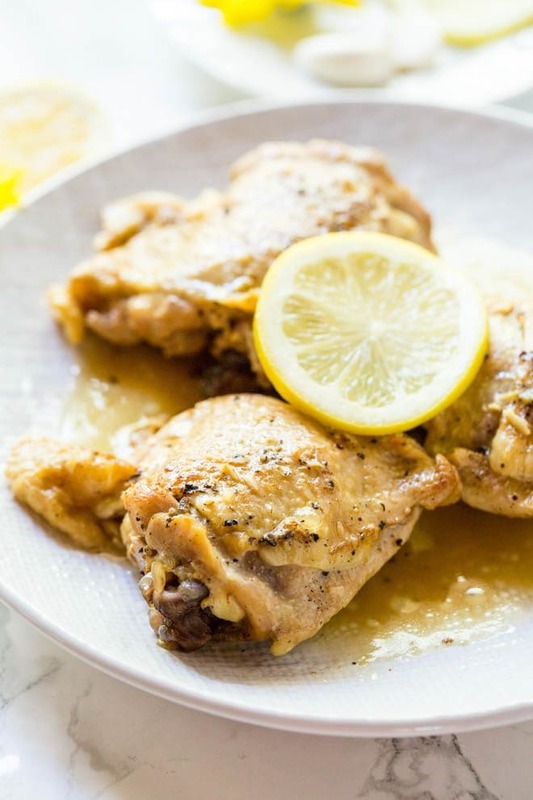 Instant Pot Lemon Butter Garlic Chicken Thighs combines two of my favorite flavors in one easy dinner recipe. Combining only a few simple ingredients in a pressure cooker yields the most flavorful chicken thighs. Serve it with a side of Asparagus with Burrata cheese for additional low-carb nutrients and flavor. The meal is perfect for any day of the week and is great for kids and adults. Make the chicken in advance and reheat for lunch or dinner throughout the week. I’m excited to partner with Atkins again to share this low carb flavor-packed recipe. Atkins-inspired recipes offer a balanced approach with foods containing fiber-rich, nutrient-dense carbohydrates, healthy fats and optimal proteins, while focusing on reduced levels of refined carbohydrates and added sugars. 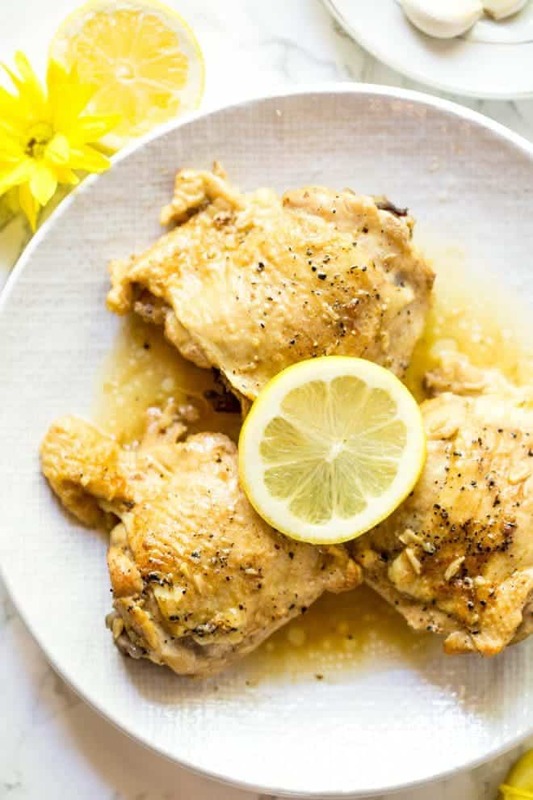 Instant Pot Lemon Garlic Butter Chicken Thighs is a quick and easy meal for a balanced low-carb lifestyle. Combine butter, chicken, chicken stock or bone broth, lemon juice, garlic, salt and pepper in a pressure cooker or Instant Pot. In less than 30 minutes, you have a high quality, low carb meal on your dinner table. For more low carb recipes, simple solutions for reducing carb and sugar and meal plans, check out the new lifestyle book Atkins: Eat Right, Not Less. The book features 100 whole-food, low carb recipes and explains the “hidden sugar effect” – foods that you think are healthy that actually turn into sugar when digested. You don’t see the sugars, but your body does. Recipes include everything from Portobello Pizza to Double Chocolate Brownies. 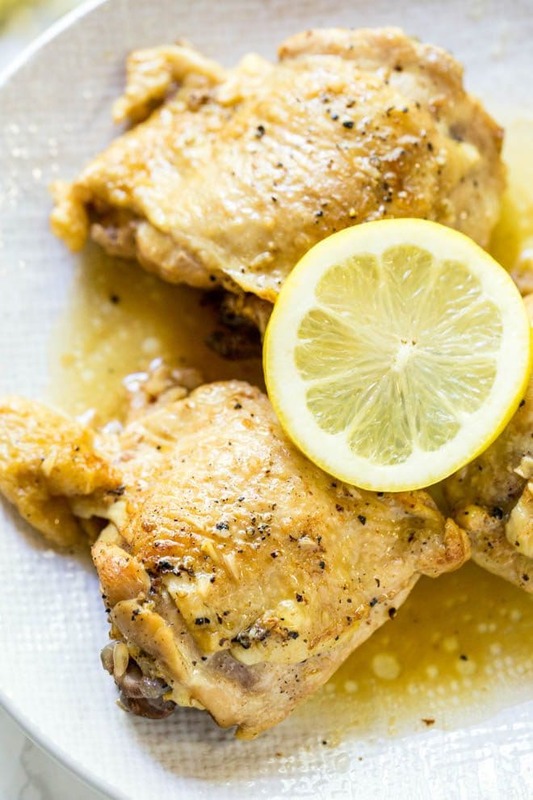 To make lemon butter garlic chicken in the instant pot, pat the chicken dry and season with salt and pepper. Set the instant pot or pressure cooker to sauté mode and then add the butter to the pot. Once the butter is melted, add the chicken thighs skin side down. Cook for 3 to 4 minutes on each side until skin is golden brown. Remove chicken thighs from pot and set aside. Next, add the stock and lemon juice to the pot. Hit the cancel button on the pot to cancel the sauté mode. Add the chicken thighs back to the pot. Add the whole garlic cloves. Lock the lid and turn the valve to seal. Cook at manual pressure for 12 minutes, and allow the pot to do a full natural pressure release (mine takes about 15 minutes to depressurize). Internal temperature should be at or above 165°F. Serve the chicken with a simple side dish. 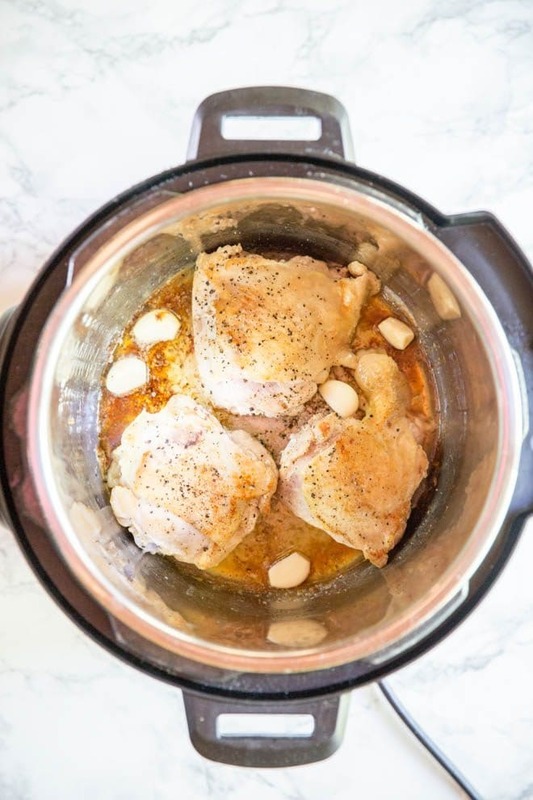 Cook chicken thighs in the instant pot in less than 30 minutes. For a crispy texture, cook the chicken on each side on sauté mode until golden brown. Turn off sauté mode and cook at manual high pressure for 12 minutes or until internal temperature is 165 degrees F. Natural release before serving. To make chicken thighs in the slow cooker, lay the chicken thighs on the bottom of a slow cooker. Add other ingredients including liquid and seasonings. Cook on low for 6 hours or high for 2 to 3 hours or until the internal temperature reaches 165 degrees on an instant read thermometer. Visit AtkinsEatRightNotLess.com to learn more about the Atkins: Eat Right, Not Less lifestyle book and explore more about the Atkins low carb lifestyle. If you are exploring the keto way of eating, learn more about how Atkins offers a more flexible keto diet with a range of food choices and balance of micronutrients within its Atkins 20 and Atkins 40 programs. Sign up for our newsletter for more chicken thigh recipes, low carb dinners and more! 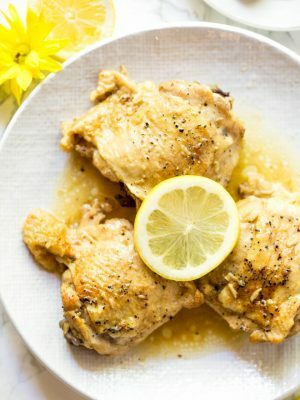 Lemon Garlic Butter Chicken Thighs are made in the Instant Pot or pressure cooker with a few simple ingredients! The recipe is low carb and packed with flavor. Set the Instant Pot or pressure cooker to sauté mode. Add butter to the pot. Once butter is melted, add the chicken thighs skin side down. Cook for 3 to 4 minutes on each side until skin is golden brown. Remove chicken thighs from pot and set aside. Add stock and lemon juice to the pot. Hit the cancel button on the pot. Add the chicken thighs back to the pot. Add the whole garlic cloves. Lock the lid and turn the valve to seal. Cook at manual pressure for 12 minutes, and allow the pot to do a full natural pressure release (mine takes about 15 minutes to depressurize). Internal temperature should be at or above 165°F. Serve with a simple side dish and enjoy! Optional: Use an immersion blender to puree garlic cloves once chicken is cooked. Turn pot to sauté and let mixture reduce. Pour over chicken thighs for additional flavor. *Cook time may vary slightly, based on the size of your chicken thighs. This is a sponsored conversation written by me on behalf of Atkins Nutritionals . The opinions and text are all mine. This post contains affiliate links.